Aquatic Exercise Routines: See How Easy & Fun It is to Burn More Fat and Reshape Your Body with this Low-Impact Water Aerobic Workout! Discover here the awesome weight loss benefits of aquatic exercise routines and the key tips on how to maximize them during your aqua aerobic exercises. The very first thing you should know is that, used correctly, many aqua aerobic exercises give you the right mix of aerobic workout and low impact strength training. “Right mix” means that you’ll burn calories AND build muscle mass at the same time, greatly increasing your fat burning long after your workout is over. You’ll shape up in no time. Plus, it’s relaxing and fun! Are you self conscious about wearing a swimsuit? You don’t have to worry about it. Simply wear long Lycra pants and a T-shirt. Also known as aqua aerobic routines, water aerobic workout, aquatic therapy, aqua fitness or water aerobics, exercising in water is the ideal workout – whether you’re overweight or have limited mobility due to an injury, painful joints, fragile bones or weak muscles. With most aquatic exercise routines there’s very little jarring on your body’s joints, bones and ligaments while the resistance provided by the water is enough for a high calorie consumption. And the deeper the water and the harder you work against it, the greater the resistance your muscles encounter and the harder your workout, resulting in a greater amount of fat burnt longer after your workout while your body rebuilds your muscles. …often more efficient than the same activities done on land. For example, 30 minutes of deep water running burns 300 calories, compared with only 200-250 calories burnt running on land. If you weigh 150-180 pounds, you burn 300-400 calories on a half-hour swim at your target heart rate. Compared with swimming, a horizontal exercise performed on the top of the water where the water resistance is minimal, exercising vertically, below the surface where drag is greater, increases the workload a lot more. The most efficient aqua aerobic routines give you similar results like other aerobics performed on land with greater joint load: walking, jogging, cross country skiing, biking, dancing, kickboxing, jumping jacks, or interval training. Leg lifts, scissors, curls, push ups, push-aways, flutter kicks, knee ups, leg overs are the most effective aquatic exercises. Often times you’ll be able to find Aquarobics, AquaGym or AquaTrain classes at your local community center and they typically can provide the basic equipment you need. The classes are usually taking place in chest-deep water, so you don’t even need to be a swimmer. 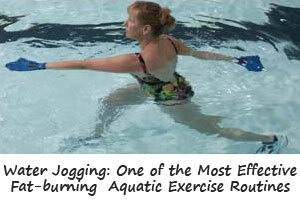 But, if you’re doing your aqua aerobic routines in water deeper than that, you need a float of some sort. This can be either a flotation belt or vest, or simply an old life jacket – as long as it provides enough buoyancy to keep your head above water and doesn’t interfere too much with the movement of your arms. However, if you are having a significant amount of body fat, this gives you enough buoyancy to not need any additional floaty. 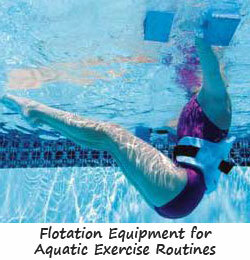 In contrast to other exercising equipment, water fitness equipment is very affordable, as foam is quite cheap. However, not having any aquatic equipment at all is not a reason to miss the great weight loss workout and stress relief that fun aquatic exercise routines provide.